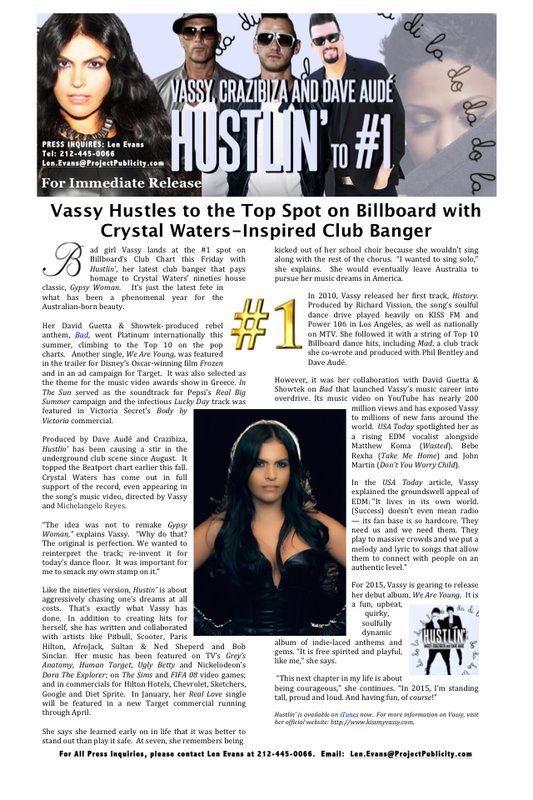 Vassy’s “Hustlin’” will be the #1 record on Billboard’s Dance Club Songs chart tomorrow! The song pays homage to Crystal Waters’ nineties house classic, “Gypsy Woman”. Bad girl Vassy lands at the #1 spot on Billboard’s Club Chart with Hustlin’, her latest club banger that pays homage to Crystal Waters’ nineties house classic, Gypsy Woman. It’s just the latest fete in what has been a phenomenal year for the Australian-born beauty. Her David Guetta & Showtek- produced rebel anthem, Bad, went Platinum internationally this summer, climbing to the Top 10 on the pop charts. Another single, We Are Young, was featured in the trailer for Disney’s Oscar-winning film Frozen and in an ad campaign for Target. It was also selected as the theme for the music video awards show in Greece. In The Sun served as the soundtrack for Pepsi’s Real Big Summer campaign and the infectious Lucky Day track was featured in Victoria Secret’s Body by Victoria commercial. Produced by Dave Audé and Crazibiza, Hustlin’ has been causing a stir in the underground club scene since August. It topped the Beatport chart earlier this fall. Crystal Waters has come out in full support of the record, even appearing in the song’s music video, directed by Vassy and Michelangelo Reyes. Like the nineties version, Hustin’ is about aggressively chasing one’s dreams at all costs. That’s exactly what Vassy has done. In addition to creating hits for herself, she has written and collaborated with artists like Pitbull, Scooter, Paris Hilton, AfroJack, Sultan & Ned Sheperd and Bob Sinclar. Her music has been featured on TV’s Grey’s Anatomy, Human Target, Ugly Betty and Nickelodeon’s Dora The Explorer; on The Sims and FIFA 08 video games; and in commercials for Hilton Hotels, Chevrolet, Sketchers, Google and Diet Sprite. In January, her Real Love single will be featured in a new Target commercial running through April. She says she learned early on in life that it was better to stand out than play it safe. At seven, she remembers being kicked out of her school choir because she wouldn’t sing along with the rest of the chorus. “I wanted to sing solo,” she explains. She would eventually leave Australia to pursue her music dreams in America. In 2010, Vassy released her first track, History. Produced by Richard Vission, the song’s soulful dance drive played heavily on KISS FM and Power 106 in Los Angeles, as well as nationally on MTV. She followed it with a string of Top 10 Billboard dance hits, including Mad, a club track she co-wrote and produced with Phil Bentley and Dave Audé. However, it was her collaboration with David Guetta & Showtek on Bad that launched Vassy’s music career into overdrive. Its music video on YouTube has nearly 200 million views and has exposed Vassy to millions of new fans around the world. USA Today spotlighted her as a rising EDM vocalist alongside Matthew Koma (Wasted), Bebe Rexha (Take Me Home) and John Martin (Don’t You Worry Child). For 2015, Vassy is gearing to release her debut album, We Are Young. It is a fun, upbeat, quirky, soulfully dynamic album of indie-laced anthems and gems. “It is free spirited and playful, like me,” she says. Hustlin’ is available on iTunes now. For more information on Vassy, visit her official website: http://www.kissmyvassy.com. Previous Post@RJ2Letters Just Made the Fountain Run *Drip, Drip*…… (You know what we mean)Next PostRemy Man, I mean Ma is Aggy for this one.